Decorate your table for the big feast with this collection of 20 Thanksgiving Craft Centerpieces. Find floral Thanksgiving centerpieces, turkey Thanksgiving centerpieces and much more. Some of these Thanksgiving table decor ideas are small enough to bring as a host gift to dinner. Others are great activities to do with kids this Thanksgiving. These Thanksgiving craft centerpieces will surely add just the right atmosphere to any autumn celebration. Don’t delay the festivities a moment longer when you use these awesome Thanksgiving crafts to brighten your home. Your dinner guests will be delighted and impressed with the results of your handiwork. Plus, you’re sure to make some great memories along the way as you prepare for the exciting feast. The great part about these Thanksgiving decoration ideas is that many of them can last for years to come. You'll also be sure to adore this 24 Thanksgiving Dinner Recipes and Fall Craft Projects free eBook. Fall in love with these amazing and inspring fall craft ideas. These DIY centerpieces are sure to make your Thanksgiving a little bit more special. Thanksgiving centerpieces come in all shapes and sizes, but these lovely ideas are a cut above the rest. Experiment with leaves, mason jars, and candles as you prepare for the big feast. Autumn Leaves Centerpiece: Colorful leaves are the foundation of Thanksgiving craft centerpieces. Fall Leaves Candle: For a smaller table, thisThanksgiving centerpiece is perfect. Autumn Votive Centerpiece: Display a line of orange votive candles with this beautiful thanksgiving centerpiece craft. NEW! Autumn Themed Mason Jar Table Centerpieces: This beautiful centerpiece would be perfect to have out all season long. You could also display two right outside your front door for a warm welcome to all friends and family. You can find all of our Thanksgiving collections in one place! Visit 250+ Thanksgiving Crafts for Kids and Adults for more Thanksgiving crafting inspiration. It's hard to imagine a better way to utilize pumpkins than with these amazing pumpkin crafts that will look awesome as DIY centerpieces. If you're feeling adventurous, you'll also want to try your hand at crafting your very own cornucopia. With fall craft ideas like these, your holiday season will be anything but dull. Sparkle and Shine Pumpkins: Three craft pumpkins painted in fall colors are all you need for a Thanksgiving centerpiece. Berries Centerpiece: Use berries to create beautiful thanksgiving craft centerpieces. Thanksgiving Cornucopia: Use chicken wire and burlap to create a rustic cornucopia centerpiece for Thanksgiving. Gold Swirl Pumpkins: The great thing about this centerpiece is that you can use it into Halloween. Glammed up with sparkles and glitter, these pumpkins are just the thing to add some razzle dazzle to your holiday. NEW! Prized Pumpkins: You'll go crazy for this amazing pumpkin painting idea. Enjoy making some fabulous pumpkin crafts with this tutorial. These adorable Turkey crafts are sure to make your Thanksgiving festivities that much more fun. Have a blast turning everyday items into wonderful Thanksgiving crafts like these. You won't be disappointed when you try out these fabulous fall crafts. 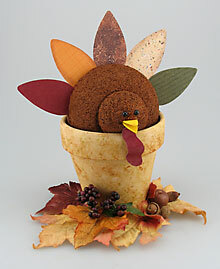 Turkey Centerpiece: This Thanksgiving centerpiece, made with a clay pot, disguises an air freshener. Tom the Turkey Pumpkin: Kids can help create this fun Thanksgiving turkey centerpiece. Turkey Wobbler: Use felt to create this adorable turkey chef to sit in the middle of your table. Nature's Turkey Centerpiece: Made with natural elements, this turkey centerpiece is great for kids and adults alike! NEW! Paper Bag Turkey with Popcorn Stuffing: It's hard to imagine a more fun turkey craft than this hilarious "stuffed" turkey. You'll have a blast making this clever Thanksgiving craft. NEW! Turkey Table Accents: Let these adorable turkeys grace your table this Thanksgiving. Look no further for amazing Thanksgiving crafts than this one here. The fun will never end when you try one of these Thanksgiving craft ideas to spruce up your Thanksgiving table with. Your family and friends will love these charming fall crafts and be envious of your crafting skills. Take pride in these lovely Thanksgiving decoration ideas that will leave you feeling inspired. Pumpkin Centerpiece: Create an easy Thanksgiving craft centerpiece featuring a textured pumpkin. 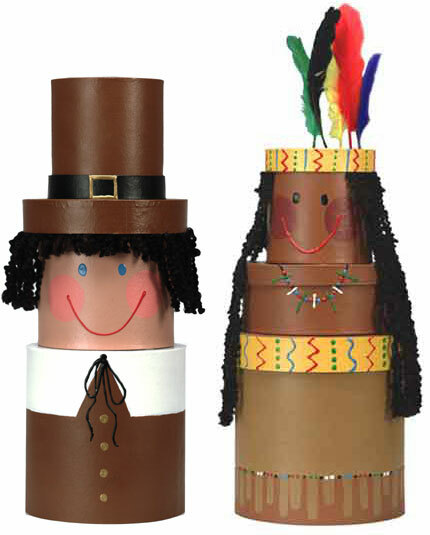 Indian and Pilgrim Table Toppers: Paint and assemble various boxes to create these table toppers. Candle Centerpiece: A diamond cut pumpkin holds up this a floral ring in this Thanksgiving centerpiece. Metallic Leaves Candle: Great to use as a hostess gift or on the mantel, these festive candles are elegant and beautiful. NEW! Eyelet Pumpkins: This paper craft makes a lovely centerpiece idea when you want to impress your guests for Thanksgiving dinner. These cute little pumpkins will look great the rest of fall as well. If you liked these projects, check out our free eBook Holiday How-To: Thanksgiving Crafts and Pumpkin Recipes eBook with some of our favorite Thanksgiving crafts for the season. I enjoy decorating my table and kitchen for Thanksgiving and these 20 ideas are pretty, and can be inexpensive to make. When I think of Thanksgiving I think of the colors brown, orange, gold, green and leaves turning colors. I especially like the centerpiece made using the votive candles and the autumn color leaves. This will give my table the true ambience of fall and giving thanks always.